Touch-based mobile fingerprint acquisition systems use a solid flat sensor that requires contact of the finger on the sensor surface. Captured fingerprint images are easily affected by the condition of the finger surface and the manner of finger pressing. A layer of fatty acids is left on the sensor each time it is used. (When investigators collect a print from a crime scene, the residue is what is used to extract the latent print.) These fatty secretions accumulate over time causing distortion of the touch-based sensor. This often results in problems such as image deformation, durability weakening in the sensor, latent fingerprint issues which can lead to forgery and also hygienic problems. Additionally, since the image varies with each impression, each ﬁngerprint image from the same ﬁnger can appear quite different. With ONYX 4 touchless mobile verification, these problems don’t exist. As the finger doesn’t contact anything, we avoid many of the issues inherent in touch-based capacitive sensors. Fig. 2. Gray-value image captured using ONYX 4 with a mobile phone camera. The clarity of the image is noticeably better than the touch-based sensor images in Fig. 1. 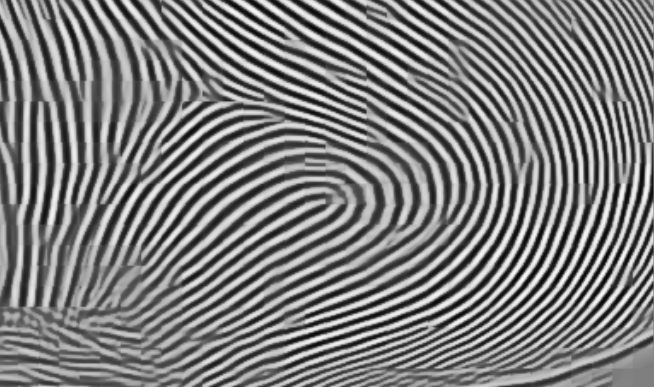 The ﬁngerprint image can be acquired without plastic distortion from contact pressure. Latent ﬁngerprints do not appear on the sensor, reducing the chance of compromised biometric data. A large image area can be captured quickly. The large data capturing area of a mobile phone camera can provide much more information than the small-area touch fingerprint sensor. The technology is not susceptible to electronic discharge damage. Given the accuracy facts listed above, ONYX 4 achieves a higher biometric performance compared to touch-based sensors. Hiew, Bee Yan. "A Secure Digital Camera-based Fingerprint Verification System." Journal of Visual Communication and Image Representation. 21.3 (2010): 219-231. Lee, Chulhan. "A Study of Touchless Fingerprint Recognition System." SSPR&SPR. 4109 (2006): 358-365. Print. Sano, E. SICE-ICASE, 2006. Working with Fingerprint Authentication Using Optical Characteristics in a Finger." SICE-ICASE, 2006. International Joint Conference. (2006): 1774-1777. Yang, Bian. "Collecting Fingerprints for Recognition Using Mobile Phone Cameras." Proceedings of SPIE, the Intern ational Society for Optical Engineering. Oppland, Norway. The future of biometric identification is here.